This example specifies the statistic for the response variable that is displayed by the block map. The STATISTIC= option specifies that the statistic is frequency rather than the default statistic (sum). Define the title for the map. Produce the block maps. These include Puerto Rico and the District of Columbia. 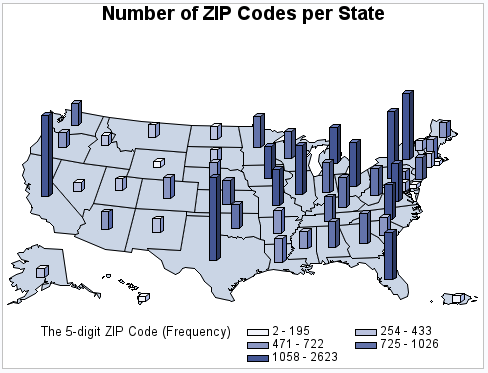 The ALL argument specifies that the output should include all of the map areas from the map data set, even if the response data set SASHELP.ZIPCODE does not include an observation for the map area. The STATISTIC= option specifies the statistic for the response variable. The LEVELS= option specifies the number of response levels. The RELZERO option specifies that the blocks values are relative to zero.